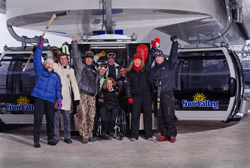 Sun Valley Resort hosted on Saturday a celebration of the completion of the new Roundhouse gondola on Bald Mountain. Some of the first to ride the gondola were nine Sun Valley Olympians. Reuniting at the top terminal are, from left to right, Betty Bell, 1952 U.S. Olympic Ski Team; Dates Fryberger, 1964 U.S. Olympic Hockey Team; Reggie Crist, 1992 U.S. Olympic Ski Team; Sondra Van Ert, 1998 U.S. Olympic Ski Team; Tyler Palmer, 1972 U.S. Olympic Ski Team; Muffy Davis, two-time overall World Cup Paralympian, 2001-02; Jon Engen, 1988, 1992, 1994 U.S. Olympic Ski Team (Nordic); Maria Maricich, 1984 U.S. Olympic Ski Team; and Terry Palmer, 1972 U.S. Olympic Ski Team. Sun Valley will begin its 74th ski season Thanksgiving Day, Nov. 26. Photo courtesy of Sun Valley Co.
Should Magic Reservoir be dredged? Call me a guy, but give me a break. Sarah Palin is the luckiest woman on the planet. Local soup kitchens report serving double and triple the numbers from a year ago. A terrorist’s words a threat to U.S. democracy?